As Sony announces its new VAIO Fit line of consumer laptops, it’s leading a charge—a necessary one—into the world of touch. Touchscreens will be available across the entire product line, and standard on some models. In a briefing last week, Sony said that it expected touchscreens to overtake non-touch displays rapidly as the laptop norm. Touchscreens are available on all Fit models as standard or optional equipment. Sony also expects design to matter as much as features. The Fit product line will feature brushed-aluminum cases on higher-end models, and hot pink as a color choice along with the more typical black, silver, or white. The Fit E series will come in black, pink, or white. Available by mid-May, the Fit line will offer two levels of product. Each level will offer a 14-inch version with an HD+, 1600-by-900-pixel display, and a 15-inch version with a full HD, 1920-by-1080-pixel display. The VAIO Fit E 15-inch laptop's display is full HD, 1600-by-900-pixel resolution. CPUs will range from Pentium through third-generation Intel Core i3, i5, and i7 processors. Intel HD or HD4000 graphics will be standard, with the option of choosing NVidia GeForce GT 735M or 740M graphics upgrades, with up to 2GB of VRAM. A standard 4GB of RAM on all models will be upgradable in some to 6GB or 8GB total. On-board storage will range from 500GB to 1TB traditional hard drives, as well as Hybrid and SSD options. Optical-drive options are also available. 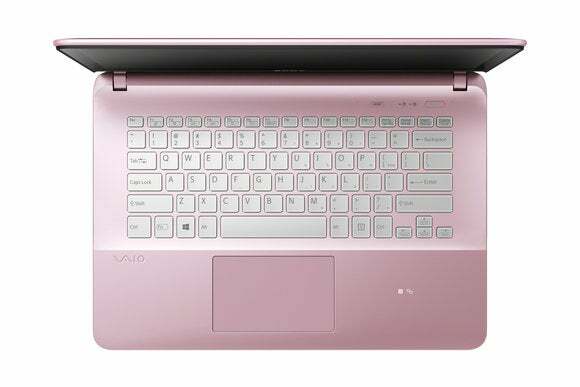 Sony VAIO Fit keyboard on a 14-inch model. The keyboards are all full-sized and backlit, with a full numeric pad for users with 15-inch models. On the 15-inch Fit models, there’s also a full number pad. Sony has integrated near-field communication (NFC) technology into the wrist-rest area of the laptops. Still pretty rare on regular computers, it’s much more common in smartphones and tablets and could lead to some interesting apps. For now, it helps the Fit do simple things with another NFC-equipped device, such as facilitating Bluetooth and WiFi connections. Windows 8 or Windows 8 Pro are available for all models. Sony also bundles ArtRage Studio for digital art painting, and Sony Imagination Studio VAIO Edition for media creation and editing. The Fit product line will feature aesthetics including brushed-aluminum cases on higher-end models, and hot-pink coloring along with the more typical black and silver. The regular Fit series offers brushed-aluminum casing, whose colors are somewhat confusingly named Steel Black, Steel Pink, and Steel Silver. Prices start at $649 for the 14-inch model and $699 for the 15-inch model. The lower-cost ‘E’ series will have 14-inch models starting at $549, and 15-inch models starting at $579. The E series laptops’ plastic cases will come in black, pink, and white. Consumer laptops are competing with a ravenous swarm of smartphones and tablets. 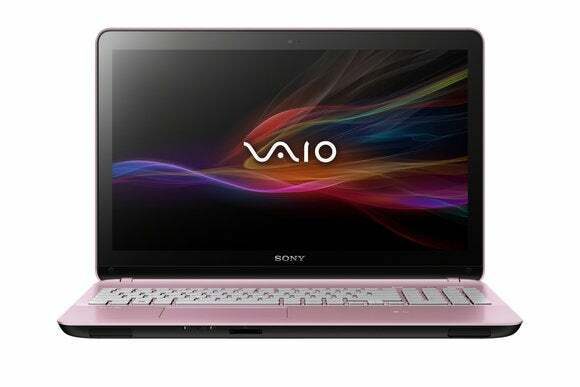 Facing a relentless swarm of smartphones and tablets eating away at the low end of the laptop market, the VAIO Fit models have to stand out—and to justify the higher prices that Sony typically charges. These models stand out primarily for their touchscreens, but they also have good design and generous features.